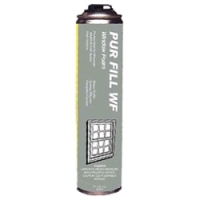 PUR FILL WF has been specially formulated to be used to seal out drafts around windows and doors. It has been tested and conforms to AAMA-812. Note that an application gun is not provided, but may be purchased separately (see related products below). Minimum Can Temperature: 60 degrees F.
Important Note: Conservation Mart cannot accept returns or issue credit for Pur Fill Window Foam. NOTE: This item is non returnable and no credits can be issued. Also, due to the chemical nature of this product, this item cannot ship outside of the 48 contiguous US states.